It’s a sure sign of summer when the Door County fruit growers show up at the farmer’s market with boxes and boxes of sweet, red cherries. So in the last week or so, I may have gone a little overboard on my farmer’s market cherry purchases. I can’t help it, they’re just so fantastically good. And with an abundance of these perfectly ripe, delicious cherries in my house, I figured some sort of cherry recipe was in order. And then it hit me - upside down cake. Upside down cake has got to be my favorite type of cake, probably due in large part to the gooey fruit and sugar topping you get when you flip the cake. My husband is nice enough to make me a pineapple upside down cake every year for my birthday, and I eat pretty much the whole thing. I've also made apricot and blackberry upside down cakes with great success. So I figured I couldn't go wrong with a cherry version. In fact, the cherry upside down cake turned out even better than I had anticipated. 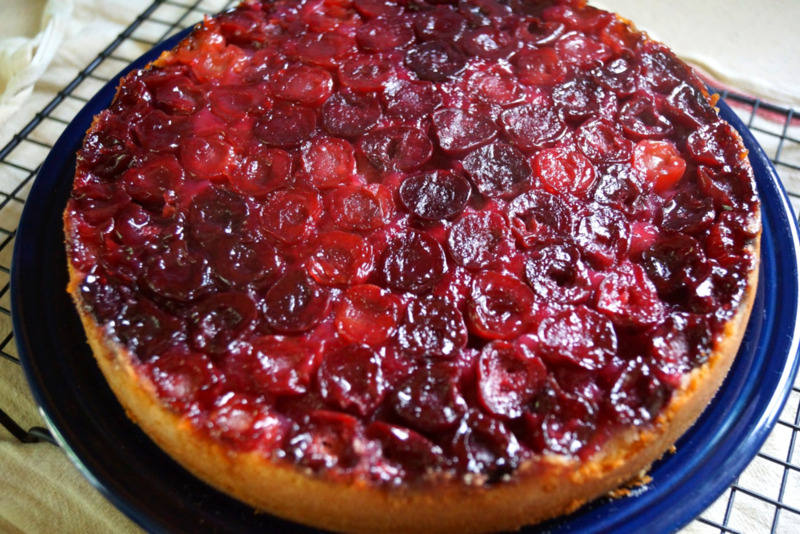 The moist almond cake complimented the gooey cherry topping perfectly. Not to mention, it looks pretty impressive when you flip it out of the pan. You may think I’m a little overboard on the pan prep for this cake. This may be, but as we all know, an upside down cake has a key presentation element that relies heavily on the cake being able to flip out of the pan, preferably in one piece. I find that my cakes will still sometimes stick to my bakeware, even when I spray them down like crazy. So for cases like this, I tend to err on the side of caution and use parchment, cooking spray, AND a dusting of flour on the sides of the pan. Yes, it’s a pain, but for me, this method has always resulted in a successful flip. Anyways, enough about pan prep, here’s the recipe! 1. Preheat oven to 350. Spread slivered almonds on a sheet pan and toast in oven at 350 for 6-8 minutes, or until they are golden brown and fragrant. Leave oven on for baking cake. 2. Spray a 9-inch round cake pan with cooking spray and line the bottom with a round of parchment paper (the easiest way to do this is trace the bottom of the pan on the parchment, then cut out the traced circle and it will fit perfectly into the pan). Dust sides of pan with flour and tap out any excess. 3. Cut each cherry in half, remove the pit, and arrange cherries cut side down on the bottom of the cake pan until the entire pan is covered. Sprinkle evenly with ¼ c of the sugar. 4. Mix the flour, baking powder, and salt together in a medium bowl. 5. In a larger bowl, cream the butter and sugar together until fully combined and the mixture is light and fluffy. 6. 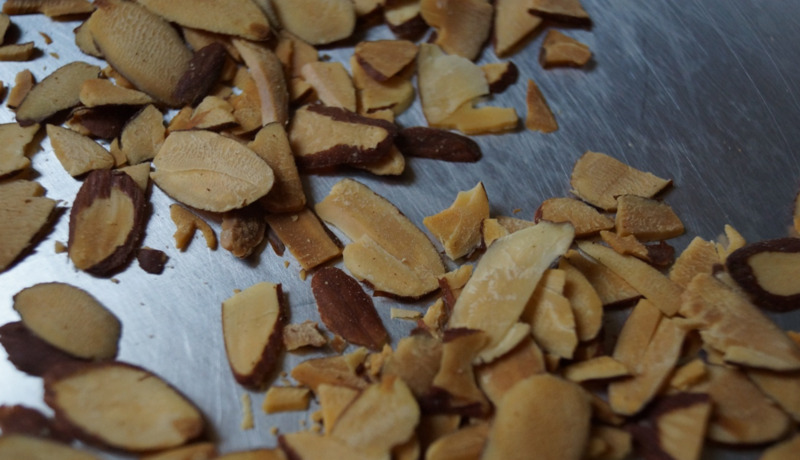 Add the eggs, followed by the almond extract; continue mixing until thoroughly combined. 7. Add the flour mixture in 3 additions, alternating 2 additions for the buttermilk. Mix until everything is just combined. 8.Pour batter on top of cherries in prepared pan and bake at 350 for 50-55 minutes or until cake is golden and a toothpick inserted into the cake comes out clean. 9. Cool cake for about 10 minutes on a wire rack, then run a sharp knife around the edges of the cake to loosen the cake from the sides. Flip cake onto a plate and remove the parchment paper from the top of the cake. 10. Sprinkle top of cake with toasted almonds and dust with powdered sugar if desired.